Want big? Melbourne Festival has big. At the beginning of the festival, unassuming Melburnians will be treated to a free major outdoor performance by acclaimed Basque street theatre company Deabru Beltzak. 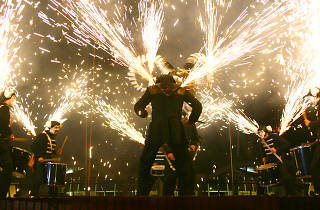 Les Tambours de Feu is inspired by the Basque tradition of the ‘fire-run’: a sensory, paganistic flood of pyrotechnics and ritualistic percussion. See Time Out's top picks of the Melbourne Festival. Saw this on Thursday 6th Oct. The performance is mobile and moves from place to place and becomes a surge of people following beating drums. Must have looked crazy from the outside. Had a great time chasing the troupe around but must watch where you're going. Recommend that you go by yourself or arrange a place to meet up afterwards. It's hard to keep track of people in the moving crowd and it's easier to move through the crowd if you're by yourself. Not recommended for very old or very young as it becomes quite pushy inside. Pyrotechnics were great and the strobing fireworks were especially dazzling. Literally.